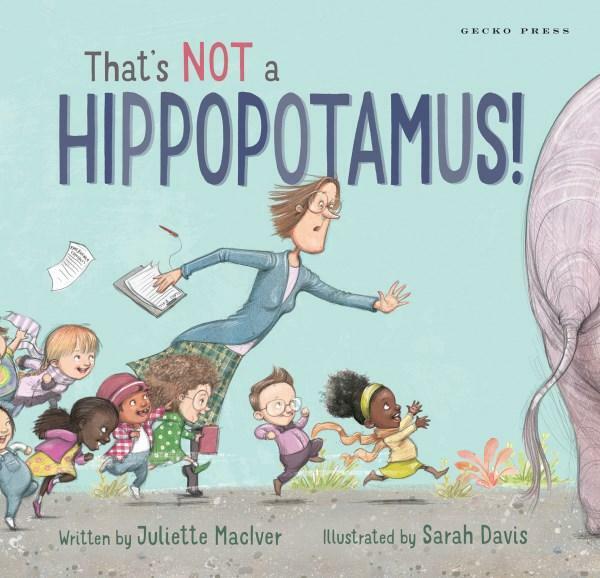 For ages 3 to 5 years, That’s not a hippopotamus is a brilliantly illustrated and very clever picture book. Davis’ characterisations of the children, and in particular the teacher, are genius. When a class of very young children go on an excursion to Don’s Safari zoo they are intent on finding a hippopotamus which eludes them for most of the day. Ranger Don leads them on a ridiculously funny adventure as they fly across the pages kicking up dust, laughing, screeching with fear or delight and having a wonderful time in search of the hippo. During their adventure they manage to come across Ibex, giraffe, zebra, elephant, warthog, boa constrictor, a selection of reptiles, a hilarious collection of birds hiding in a forest scene and a walrus until eventually the hippo sneaks up behind and dressed as a tourist. Davis’ colourful illustrations on white background are perfect and the children’s facial expressions and individual little characters are a delight. The harried spinster-like teacher survives being strangled by a boa constrictor and rubbed up against by a friendly warthog. Maclver’s rhyme flows beautifully providing just enough hints for Davis to explore a variety of animals. I particularly like the background stories on each page. of hippo–hunters in the land. I see him, Miss! He’s very quick! Maclver and Davis are an exceptional combination. I’m sure this story will be read over and over and delight the reader and listener every time.